Talk to me, Tivo: Michael takes the Dunder-Mifflin employees ice skating to celebrate his birthday. Jam Cam: Wow. Finally, Jim has found a way to woo Pam — earning money from a pyramid scheme. Or not. Pam gets stuck helping the party planning committee plan for Michael’s big birthday even though she wants to strangle Angela in the process. Meanwhile, Jim is showing his serious side with poor Kevin, who may or may not have skin cancer. What a downer for Michael’s birthday. Ah, the serious side of Jam, who begin to worry about Kevin. Oh, and Pam worries about seeing all the places Roy has never taken her if she only had a week to live. It would be a busy week. But right now, SchemingJam is coming up with a way to sneak out of the office and do something nice for Kevin. First, they need a diversion –in this case, Dwight — which then leads to cute little Jam smiles. SchemingJam heads to RiteAid to pick a huge number of M&M bags, a copy of American Pie 2, and 69 Cup o’ Noodles because it’s Kevin’s favorite number and his favorite lunch. If Pam paid as much attention to Jim as she did to Kevin’s favorite food, things would be much different in Scranton. 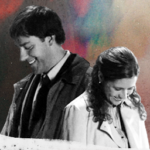 Jim surprises Pam by grabbing some fabric softener off the shelf — as if she didn’t already know he isn’t your average guy’s guy. When she asks surprised, he just kind of shrugs and says “Yeah, I use fabric softener. You don’t?” Is she not paying any attention? He is the AntiRoy! The list of AntiRoy things that Jim does would be a long one with “buys fabric softener and acts like it’s no big deal” pretty close to the top. SchemingJam returns from scheming only to be interrogated by Dwight who tried to find Jim in the bathroom by kicking in all the stalls. Dwight has way too much time on his hands. But who cares about where they were? It’s time to get their skate on at the local ice rink for Michael’s birthday. The “After School Special” moment for this episode comes courtesy of Michael, who tells Pam to check her ticking time bags in the shower. The look on Jim’s face is more of a “I feel sorry for this awkward situation Pam is in,” and less of a “I’ll help Pam with that,” which again makes him the AntiRoy. So after giving Michael his Night Swept, Pam says today was a good day. To go along with those sentiments, instead of shots of skating or eating Michael’s birthday cake, our dear camera crew splices in a shot of Pam and Jim shopping at RiteAid. They knew exactly what she meant by her comment even if she didn’t. The Others: It’s Michael’s birthday and apparently the only person who cares is Dwight, who creeps viewers out when he whispers in Michael’s ear “Happy birth moment,” in a way that makes you think there is more to Dwight and Michael’s relationship than just boss and subordinate. Dwight’s creep out continues when he has a fight with Angela about eating “cookies” because he is “hungry” while Ryan looks likes he’s trying to come up with every possibility on how to get out of the kitchen. I can never eat another cookie again after that. Meanwhile, everyone else in the office is worried about Kevin’s cancer scare, including Michael, who seems to take it personally that Kevin’s possible skin cancer is upstaging his birthday. The good news is that everyone ends up at the skating rink where nothing bad can go wrong. Kevin’s cancer test turns out to be negative [this is a good thing], everyone gets some skating in, and Michael charms his realtor who happened to be there with her kids. Yep, it was a good day. What have we learned today, kids: Sometimes all it takes to have a good day is the little things like going shopping for fabric softener or sharing an awkward “breast exam” moment on ice with the one you love. But won’t admit to yourself you love him. Ya know, because you’re engaged. But other than that, it’s just the little things that can make you have a good day. Pam: I feel like we should go get Kevin something. Do you think we can sneak out of here? Jim: So we got Kevin some stuff. Party pack of M&Ms, his favorite candy. A DVD of American Pie 2, which is his favorite movie and he lent it to Creed so I can guarantee you he won’t get that back. Pam: Sixty-nine Cup o’ Noodles. Jim: Which we realize sounds crass, but it is his favorite number. Pam: And his favorite lunch. [Jim grabs some fabric softener and gets a weird look from Pam] Jim: What? Pam: You use fabric softener? Pam: We should probably head back. Jim: Yeah, ok. Oh, I dare you to make an announcement. Pam: You dare me? How old are you? Pam: [into intercom as Darth Pam] Luke, this is your father. Come set the table for dinner. Pam: [into intercom] Jim Halpert, price check on fabric softener. Clerk: Ma’am, please don’t touch that. That is not a toy. Pam: [into intercom] I’m sorry. [to clerk] I’m sorry. Dwight: Where have you been? And don’t say the bathroom because I kicked in all the stalls. Jim: Well, that’s an invasion of privacy so I’m going to tell Michael. Jim: Do you think you can let go? Jim: Whoa, whoa, whoa, whoa. Michael: Hey Pam, all the stuff with Kevin, it’s pretty scary and I’m thinking that the next time you’re in the shower you should check yourself out. You know, give yourself an exam. Those things [points to Pam’s chest] are like ticking time bags. Alright? Think about it. Jim: Something to think about. Pam: Michael’s birthday was actually pretty cool. It was a good day. I don’t know. It was a good day.